Check out Hirebotics in the news! Our efforts to make automation easier for manufacturers are making headlines across the United States. Read about our story and help spread the word! Pioneer Metal Finishing has hired two robots, paying them each an hourly wage, for labor-intensive jobs that once belonged to people. DuraTech’s Paul Hatlem, left and Tim Drey show Gove. 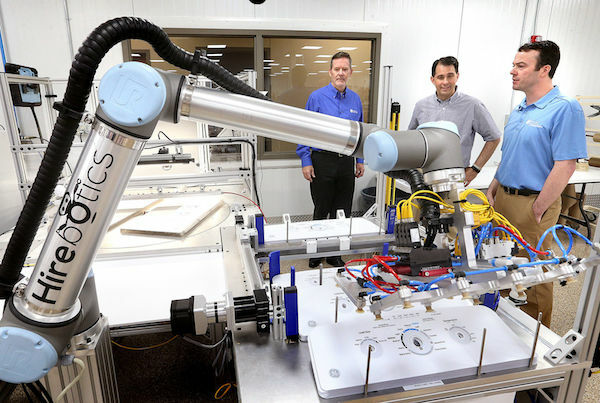 Scott Walker the manufacturer’s new automated visual inspection system Wednesday during a tour of the company’s $7.5 million expansion. While some would argue that the Washington Post has largely become a factory for politically motivated fluff pieces, yesterday there was actually an insightful article about how robotics are taking factory jobs in America that just can’t be filled. This is a drastically different story than what we’ve been told about robots stealing jobs from people. Find out how a multi-tasking, cloud-connected collaborative robot assembles a Communication Disc for Miami based startup Creating Revolutions. The small robot handles both soldering, drilling and silicone dispensing reducing double-digit rejects to near zero. A company has introduced a new way for a fabricator to use automation: not by investing in a permanent system, but by hiring them and paying for their use by the hour. The technology behind collaborative robotics is making this possible. Will the factory of the future be completely automated, with only the proverbial man and a dog—the man to feed the dog and the dog to keep the man from touching anything? It’s hard to tell at this stage in technology development, but it’s absolutely true that more and more production processes, if not entire factories, are running with limited human interaction. Out of a small garage in Nashville, TN, Matt Bush and Rob Goldiez have introduced a spin into how companies can start automating: They're renting out robots for hire. Can Automation Be Easy and Affordable for Everyone? Hirebotics is a US company based in Nashville Tennessee. Their mission is "To make automation easy, affordable and within the grasp of manufacturers across all industries and of every size and type." What if you could pay for automation the same as you do for a temporary employee? What if you only had to pay for the actual hours worked and with no upfront costs or outlays of capital? Could Hirebotics Be the Hertz of Robot Rentals? When Warren Avis in 1948 began the car rental company that bore his last name, John Hertz and his pioneering “Hertz Drive-Ur-Self System” already had had a twenty-five year head start. Matt Bush and Rob Goldiez, co-founders and principals of the world’s first robot rental startup company, Hirebotics, may well become the Hertz of robot rentals, but probably won’t get to enjoy the luxury of a quarter century head start before any competitors try to pull an Avis on them. In most science fiction, robots slowly but surely (and occasionally in terrifying fashion) take on human characteristics, like emotions or sentient thought. With his new company, Hirebotics, Franklin entrepreneur Rob Goldiez has given his robots a different human trait: an hourly wage.